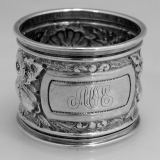 American sterling silver ornate napkin ring by Gorham Silversmiths c. 1885. This elegant and nicely detailed napkin ring has rolled edges and a high relief floral repousse body surrounding a rectangular cartouche containing an ornate period script monogram AOE . Dimensions: 1 3/4" X 1 1/2" and weighs 26 grams or 0.8 ozs Troy. The excellent original condition and clear, crisp detail, with no removals, repairs or alterations, make this an especially attractive offering. Monogrammed as described above, the soft, warm, original finish is present, with no buffing or machine polishing.